Many times a wicker set is purchased that includes a coffee table but does not include any end tables. We all seem to like end tables better than coffee tables because they are more convenient. To make a seating group more comfortable and suitable for everyone, use resin wicker end tables between furniture pieces and pieces that sit by themselves. When you lay out your patio seating furniture, you usually lay it out in an arrangement that you will use it in most frequently. Furniture is commonly arranged in a semicircle or a rectangle with a coffee table in the middle. Other times, pieces are scattered around a porch or deck for specific uses such as a chaise lounge. In these different arrangements, consider putting a resin wicker end table next to or between two pieces of furniture. Doing so will improve the convenience of those using the tables and will improve the appearance of your patio furniture arrangement. 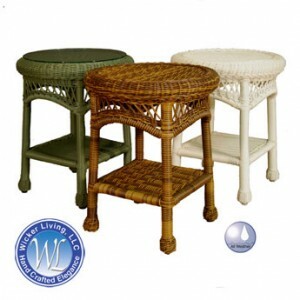 Resin wicker end tables are available in different shapes and sizes. The most typical shapes you will find are round and square top tables. Most end tables have a lower shelf. Some styles have woven tops that you have an option to add top glass and others have a frame that the top glass sits in and you can see right though to the bottom shelf. Resins come in two basic types, round and flat. If your furniture is woven with round resin cane, you will want an end table fabricated with round cane. If your furniture is made with flat cane, you will want an end table that is made using flat cane. If you are looking for a wicker end table and the one you like does not come with a glass top and you are considering not buying it, you should reconsider. Woven wicker end table tops look great, but they can be a little wobbly when you try to set a wine glass down on it. To ensure you don’t tip any drinks, make sure you get a glass top with your wicker end table. When you go shopping for a resin wicker coffee table you need make plans how you will arrange it with your wicker set to get the most value. Choose a resin end table that matches existing furniture. Use it next to or in between two pieces of furniture to make it easier and more convenient for people. Choose from popular shapes such as round and square topped tables. Use glass tops to make sure drink glasses don’t tip.